All day I’ve been feelin g like a little kid gearing up for Christmas. 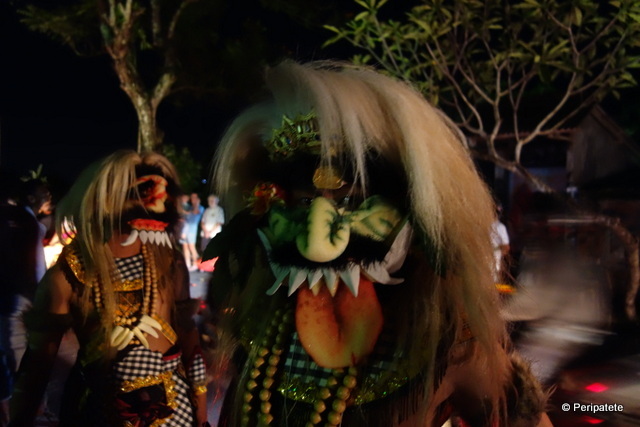 I know it’s March, so it ain’t anywhere near Christmas… but here in Bali, the big annual blow-out event – Hari Pengerupukan – happened today, on the eve of Bali’s Day of Silence (Nyepi). Gigantic, grotesquely decorated and painted representations of evil deities and other imagined characters, known as Ogoh-Ogoh, made of wood, Styrofoam (darnit! ), papier mache, took over streets all over the island. They represent the Hindu notion of Bhuta Khala (Bhuta: eternal energy; Kala: eternal time); and are manifestations of mythological beings, mostly demons or characters from the Mahabarata. During this evening’s Ngurupuk procession, when Ogoh Ogoh are paraded around, villagers came out in droves to sit on sidewalks and walk alongside the statues mounted on bamboo palaquins; gaping and gawking at the extraordinary, larger-than-life creatures. Once the parade died down, everyone gathered at the central bale, for an hour of dance, gamelan music, and a whole lot of raucousness. Though I returned home, no doubt the entertainment will continue late into the night (or even the wee hours of the morning), after which the monsters will either be set alight and burnt to the ground, or returned to their respective banjars (hamlets) – with at least one limb torn off. The practice of creating these ghastly monsters is meant to aid in the purification of the natural environment; destroying any negative element from spiritual energies and human activities. And in my hamlet, a short drive north of Ubud, the banjar boys take their duties seriously – especially when they’re given carte blanche. Donations from villagers and local businesses make it all happen. This year was no exception; the guys set up a workshop in a corner of the still-new (but well-used) bale banjar, or open-air community pavilion – quite possibly the largest and highest of its kind in or around Ubud. For weeks, just up the road from my house, they were hard at work – and play. Sculpting these monstrous effigies out of scratch and right up to the ceiling; using wood and other materials, cobbled together by many sets of hands, with hammers and pliers and saws and air-tools, with massive amounts of glue, paint, ribbons and reams of fabric. This evening was proof positive that turned over every stone, pulled out all the stops – and made their families and friends proud. And as the night quietens down, the whole island downshifts. For tomorrow is Nyepi. Day of Silence. Selamat hari raya! More images – of Ogoh Ogohs from around Ubud – will be posted soon! Next Nyepi. In Two Acts.